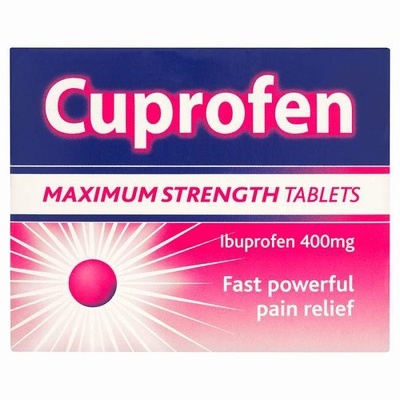 Maximum strength ibuprofen tablets (400mg). Fast powerful pain relief. For the relief of rheumatic and muscular pain, backache and neuralgia. Also for the relief of headaches and dental pain, migraine, period pain and symptoms of cold & flu. Consult your doctor if you are asthmatic, sensitive to aspirin or other NSAIDs, or are pregnant. Do not take if you have a stomach ulcer or other stomach disorders. Suitable for adults and children over 12 years.